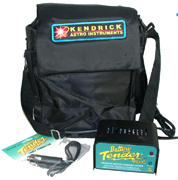 For answers to Frequently Asked Questions see the Kendrick Power Pack FAQ Sheet. Power Packs and replacement batteries will only be shipped ground service. For US and Canada orders, shipping is by Canada Post/US Postal Service. If you need a faster level of service please specify in the comments box on the order form or call us at 1-(800) 393-5456. 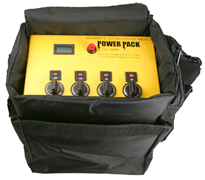 The #208 7.5 amp hour power pack is the same dependable unit as its big brother but is meant for those who want a lighter power pack and do not require a lot of power for their purposes. NEW>> Now available with Anderson Power Pole Connectors! Cigarette Sockets have permanently attached plastic caps that will flip closed to keep dirt out of the jacks when not in use. 10 amp and 5 amp circuit breakers on Cigarette Sockets. Optional Step-Up Voltage Inverter uses a 3-prong "XLR" connector to safeguard against plugging into the wrong output. Telescope Power Cords are availble for popular mounts. The cordura carry bags have a couple of bult in pockets to accomodate various batttery accessories, such as cables or the charger. 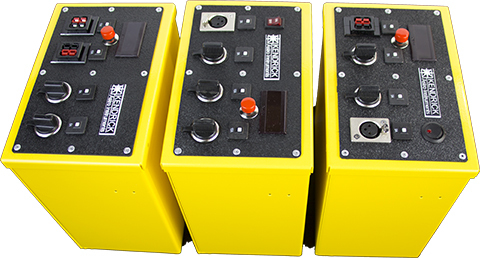 These Power Packs have the muscle to meet the demands of the modern amateur astronomer / imager. They are rugged, beautifully made and dependable. With proper care they will last for 5 years or 500 charges, whichever comes first. 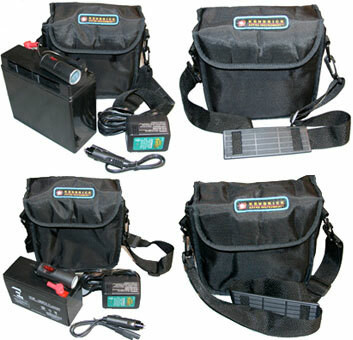 A battery float charger is included with these batteries. The included charger will never overcharge your battery and may be left plugged into the battery for extended periods of time without harming the battery. Customers outside of North America will need to choose the optional 1.25 Amp Charger and choose the plug that is appropriate for their country (see Optional Battery Chargers). When your battery dies, do not throw it away! The battery inside these units are easily replaceable! These batteries are closed with Philips Head screws and replacing a dead battery has never been easier. See our Battery Replacement Instructions. Owners of these power packs that are closed with rivets will follow the instructions as shown here. Owners of the Packs with Philips head screws will follow the same instructions but only require a Philips #8 screw driver instead of a drill and pop rivet gun. 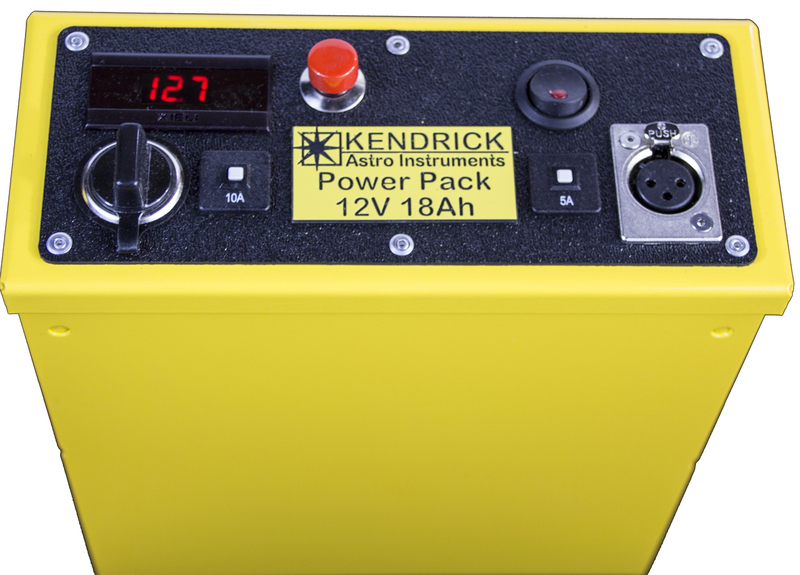 Please be aware that Premier Power Pack models with a built-in inverter will require the purchase of one of our Kendrick Telescope Power Cables to match your mount. The higher voltage output on these packs have an XLR connector to prevent your other 12 volt equipment from being plugged into it accidentally. The Telescope Power Cables mate with the XLR connector on the Power Packs. The included charger will never overcharge your battery and may be left plugged into the battery for extended periods of time without harming the battery. Customers outside of North America will need to choose the plug that is appropriate for their country (see Optional Battery Chargers). Please be aware that Premier XL Power Pack models with a built-in inverter will require the purchase of one of our Kendrick Telescope Power Cables to match your mount. The higher voltage output on these packs have an XLR connector to prevent your other 12 volt equipment from being plugged into it accidentally. The Telescope Power Cables mate with the XLR connector on the Power Packs. IMPORTANT NOTE: Do not discharge your Kendrick battery below 11.6 volts as it may be damaged internally. When charging the battery, be sure to plug the charger into the battery first, then into a wall socket. Failure to do this will result in the battery failing to charge. The charger will never overcharge the battery and may be left plugged into the battery for extended periods of time without harming the battery. 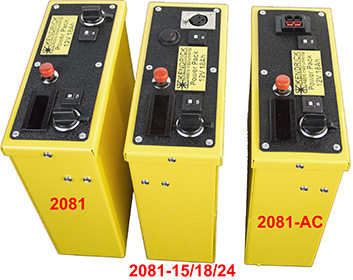 We have a 6 amp float charger available that will charge the 2082 and 2083 family of batteries in 5 to 6 hours (not recomended for the 2081 or 2080 batteries). Customers outside of North America will need to choose a battery charger with a plug that is appropriate for their country (see the shopping cart below). NEVER use an automotive charger to charge these batteries. It will ruin the battery. Automotive chargers charge at a higher voltage than other battery chargers. If the charger charges at 14.8 volts or higher, the electrolyte will begin to turn to gas and ruin the battery. In a normal car battery this is not a problem as the battery can be topped up. In a sealed battery (which ours is) the electrolyte that turns to gas will be vented through its seals and cannot be replaced." Customers are strongly encouraged to inspect and test their battery immediately upon receipt. Check to make sure it is fully charged, that the LED display works correctly, that the charger works properly.Also, be sure to continue to check the voltage for several days after receiving it. It should hold its voltage. If it does not, contact Kendrick. The battery is under warranty for three months from date of shipping. The rest of the battery pack is under warranty for 6 months after the date of purchase. Consequential damages for malfunctions, resulting from accident, misuse, abuse, failure to follow operating instruction, or unauthorized repairs will void this warranty. Every battery is shipped in a heavy duty shipping box. Customers are requested to keep this box for the warranty period in case the battery should ever need to be returned for maintenance or warranty replacement. BATTERIES MUST BE RETURNED IN THEIR ORIGINAL SHIPPING BOX FOR WARRANTY REPAIRS/REPLACEMENT. Warranties for batteries will only be honored on batteries shipped in their original packaging.